Scientists work at the front lines of global change. Their research tells us what is happening now, how things may be in future, and what we can do to alter our paths toward sustaining all species—including our own. But while the work is relevant to all, typically only scientists themselves have access to academic journals and conferences where discoveries are shared. Over the past five years, collaborators from PISCO, COMPASS, and I have offered workshops at the International Marine Conservation Congress to engage scientists in developing a skill that is universal for sharing knowledge across cultures, backgrounds, and ages: storytelling. 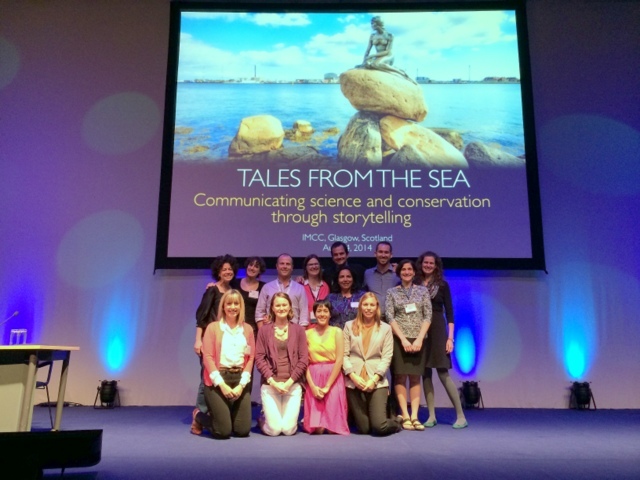 The products of this communications experiment are marine scientists’ stories of adventure, discovery, success, and hope for the ocean’s future, told to live audiences at the bi-annual International Marine Conservation Congress (IMCC) meetings and now available online for all to share. The Science Integrity Project brings together scientists, policy makers, indigenous leaders, non-profit societies and business leaders to advance and support the use of science and evidence into decision making across all levels of governance in Canada. Visit http://www.scienceintegrity.ca/ for more information about the project and how you can get involved. Coastal Connection Vancouver brings together professionals working in marine and freshwater systems from universities, NGOs, First Nations organizations, industry, and government to share research information and build connections and collaborations for conservation, restoration, and sustainability projects. Find out more about Coastal Connection events or follow Coastal Connection Vancouver on Facebook.